A qingbai porcelain Guanyin seated in a rocky, cave-like shrine in the pose of royal ease, the group supported on a concave platform. The Guanyin is dressed in layered long robes and wears an elaborate, crown-like headdress. Her left hand is covered by the pleated robe, whilst her right elbow rests on her right knee, so as to reveal her right forearm. She has a benign expression with well-defined facial features. A kundika and an auspicious bird are placed on either side of the shrine. 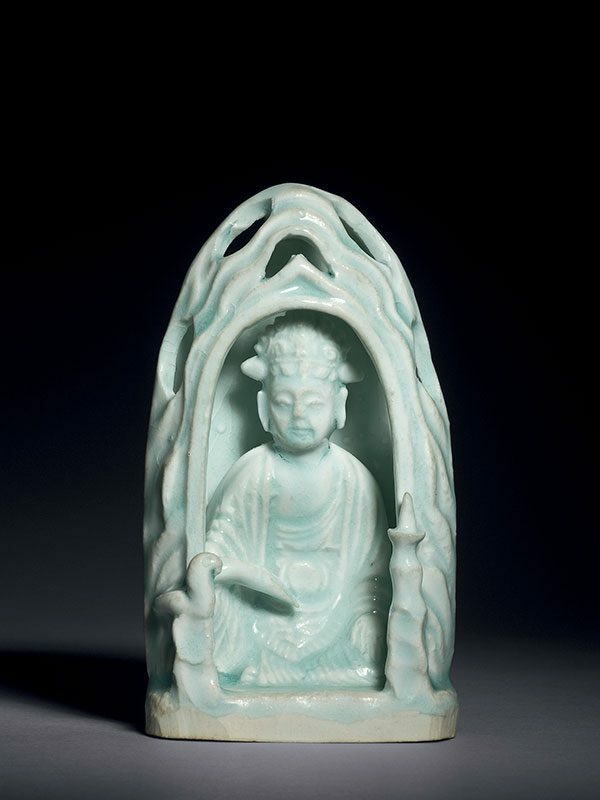 The figure and shrine are entirely covered in a transparent glaze of pale blue hue, leaving only the base unglazed, showing the fine-grained white porcelain body. Exquisitely modelled, small-scale shrines of Bodhisattva Guanyin such as the present example are extremely rare and no other qingbai examples appear to be published. Guanyin, the Goddess of Mercy and Compassion, began her life as a male, presented as the Indian god Avalokitesvara, and later became the most popular female bodhisattva in Chinese art. The cave-like shrine might represent the sacred hill of Guanyin, the Putuo Mountain (Putuoshan), which is one of Buddhism’s four sacred mountains in China and is often referred to as the ‘Buddhist kingdom on the sea.’ Three qingbai porcelain figures of Guanyin in royal ease pose, similarly decorated with a kundika and an auspicious bird to the side, are dated to either the Southern Song or the Yuan dynasty, and are respectively in the collection of the National Museum of Korea and the collection of the Jianxi Provincial History and Ancient Ceramics Committee. Two other similar qingbai figures of Guanyin depicted seated are dated to the Southern Song dynasty: one seated on a comparable rocky pedestal was excavated from Changzhou city, Suzhou province in 1978 and is now in the collection of the Changzhou City Museum; the other was excavated from a tomb in Shanghai city, dated to 1251. Most comparable examples exist in Longquan ware; a Yuan dynasty green-glazed Longquan Guanyin seated in a domed shrine on a wavy pedestal base and with a kundika and an auspicious bird to the side, is in the collection of the Shanghai Museum.